How do you build bike culture in Scarborough? Marvin Macaraig, coordinator for the Scarborough Cycles project, says part of the answer lies in working with community partners who share the vision and have the space and resources to help cyclists connect with each other. Thanks to Scarborough Cycles, residents will soon have access to bikes and tools, as well as training on safe riding and bike repair. They'll also be able to just hang out with other enthusiasts once the hubs are up and running this June. Two new hubs will be housed at Birchmount Bluffs Neighbourhood Centre (on Birchmount Road betwen Danforth Avenue and Kingston Road) and AccessPoint on Danforth part of Access Alliance Multicultural Health and Community Services (at Danforth and Victoria Park Avenues) in Scarborough will extend support for the area's growing cycling community and could help to increase and improve bike signage, bike lanes and multiuse trails in the area. Macaraig says the two hub locations were selected through a thorough research and engagement process. In 2015, partners in the Scarborough Cycles project looked into ridership patterns, as well as current and planned cycling infrastructure and “came up with a number of hot spots” for cycling. They then found “internal champions” to help launch the project. AccessPoint is near the Taylor Creek Trail and Birchmount Bluffs is a stone’s throw from the waterfront trail. The locations hold a lot of potential as additions to the city’s growing cycling network, not only as corridors to extend it, but as learning opportunities for improvement too. “Kingston Road is an ideal candidate to showcase how cycling infrastructure can be done in a suburban context,” says Macaraig. 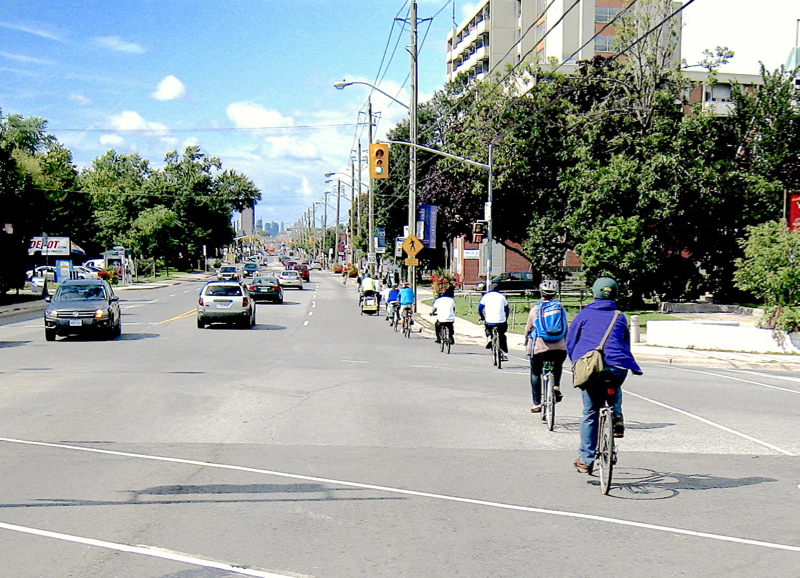 Even though the majority of bike resources, shops and attention to bike infrastructure development has been in Toronto’s core area so far, Scarborough does already have a lot to offer. Macaraig points to the multiuse path along the Gatineau Hydro Corridor between Victoria Park and Kennedy Road as one example. With some additional signage via the City’s wayfinding strategy, connections to other thoroughfares or significant locations could be clearer and would strengthen the overall network, he adds. Macaraig also points to the 12-km North Scarborough Greenloop that opened in 2014, and the 80-km network of multiuse trails launched as the Pan Am Path in 2015 as examples of growing infrastructure. There are groups such as TO35Cycles and Ward 36 Cyclists that are helping to build a cycling community, particularly in southern Scarborough. Macaraig says the hubs plan to help folks who don't necessarily fall within conventional definitions of commuters or bike enthusiasts, too. “There's a whole segment of the population in Scarborough that bike every day, but will never identify themselves as “cyclists”,” he says. Partners for the Scarborough Cycles project include CultureLink Settlement and Community Services, the Toronto Cycling Think & Do Tank at the University of Toronto, and Cycle Toronto. The Metcalf Foundation Cycle City program funds the project. dandyhorse will keep you posted on the exact opening dates and types of programming that will be offered this spring by the Birchmount Bluffs Neighbourhood Centre and AccessPoint hubs.